Perfection. We all seek it. But we all have different ideas of what ‘perfection’ is. For instance, the idea of a perfect day to me is coffee and bible study—alone. Then a lazy day curled up on the couch with a good mystery book or romcom movie on the tube. To some- that sounds boring; to me—relaxing. But some days, my perfect day idea consists of lounging in a pool or (preferably) on the beach (after my coffee and bible study). (I’d like to note that I recognize both days involve me being lazy… maybe because it’s few and far between that I get complete time to myself that has no real requirements of things that need to be done; or maybe it’s that I need to work more on my faith walk (Romans 12:11)) And I also admit, that when I get a ‘lazy day’, I am often left feeling incomplete and unsettled. So, why the inconsistencies? Because ‘perfection’ is just a perception; there is no true concept of ‘perfection’; except Christ. And even considering Jesus, and reading His Word, we still don’t know the true meaning of His ‘perfection’. (If we did, we (Christians) wouldn’t disagree on so much of what is and isn’t in the Bible).) All we can do is continue to grow in our faith, and narrow our widened path towards Christ. 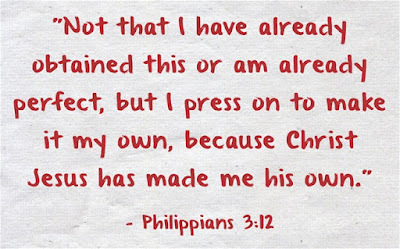 Paul was a ‘perfect’ example of striving towards ‘perfection’ aka Christ. 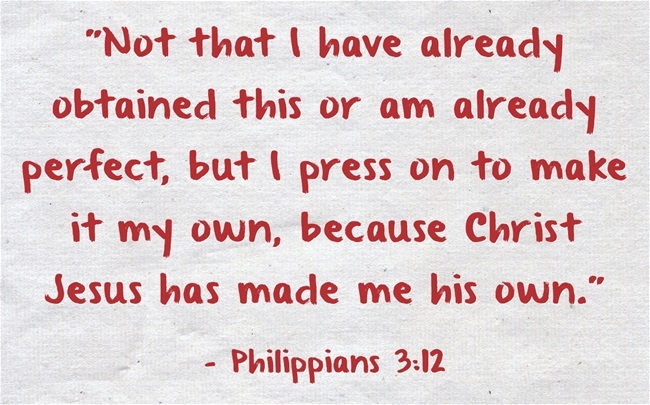 (Philippians 3:12-14) He acknowledges that he isn’t ‘perfect’ like Christ, but he’s striving to be more like Him daily, focusing on ‘forgetting the past and looking forward to what lies ahead.’ He doesn’t look back at his past mistakes (and boy did he make some! ); instead he looks forward to what God has planned for him now and in the future. In other words, don’t dwell on all that you’re not or all that you’ve done wrong. Concentrate on who you have become and what is yet to be. You are forgiven of your failures and sins. (Amen!) So move on with your faith. As you strive to become more obedient to Christ, you mature in your walk. It’s this spiritual maturity that Paul was referring to when he taught ‘perfection’. (Philippians 3:15-16). Trying to live the ‘perfect’ Christian life is exhausting, and can leave us feeling discouraged and worthless; complete opposites of what we should be feeling with Jesus in our hearts. Jesus came to save us from condemnation, not to bring doom and gloom in this already dreadful world. Faith is all we need to be made righteous with God. (Romans 3:22, Philippians 3:9) It is through His grace alone that we undeservedly receive His gift. Therefore, if He can forgive us for any and all things we’ve done and said wrong—we don’t need to try to impress Him with ‘perfection’; of which we will never attain. All we are expected to do after receiving Him into our hearts is to continue to grow and mature in our studies and understanding of His Word and spread the gospel and His love. We will never learn it all (that’s in the Bible). But we can live our lives out to what we have learned and live up to what we know thus far. We can strive to ‘perfect’ our ‘perfections’, and grow out of our ‘imperfections’. Jesus is a heart condition. He wants to change our hearts to be filled with only love; love for Him, love for others and even love for ourselves. If He can forgive our sins, why shouldn’t we forgive ourselves? ‘Perfection’ is what we strive for, yet will never achieve. But His perfect love is something we’ve all received, without having to do anything for it. Continue to grow and understand and learn and mature; never quit running the race (2 Timothy 4:7-9). Never quit growing or learning; but never let them be obstacles to your growth. Persevere in the race (Hebrews 12:1) towards ‘perfection’. But don’t get so caught up in ‘perfection’ that you lose the perception of what it is you’re really trying to achieve: to be Christ-like.